A locally owned five star hotel in Siem Reap; Royal Angkor Resort takes Khmer hospitality to great new heights along the pathway to Angkor Wat. To stay with us, we recommend all travelers to book on our website with Lowest Rate with breakfast(find it in Reservation form which appeared on the right side) - with this we ensure that you will be got special price than OTAs and other website. We're waiting to welcome you at our resort. Surrounded by rich organic landscape, the resorts manicured lawns and towering palm trees create a soft, soothing ambiance, reassured by humble Khmer hospitality and grand architectural design. Embracing its location, the resort boasts a traditional essence reflecting the nuances of Ancient Angkor: complex pillars, tall ceilings, dramatic statues along with meticulous wall carvings all follow the traditional Cambodian route, with a few artistic deviations along the way. Retreat to a cozy room with a private balcony or a luxurious Villa with a personal terrace overlooking the stunning gardens and state of the art swimming pool. Royal Angkor Resort features 198 guestrooms, suites and Villas, amply sized and filled with luxury amenities for your comfort and convenience. Royal Angkor Resort is a timeless classic that showcases a refined Cambodia and creates a genuine Khmer experience, where the finer details really do matter. 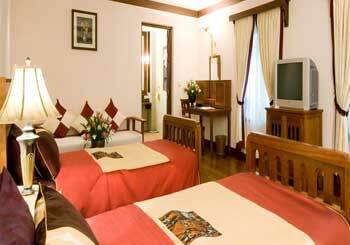 Royal Angkor Resort hosts Superior Double rooms with handmade furniture and Deluxe amenities. All Superior has Bathtub. Our room categories have Fire Smoking Detector. 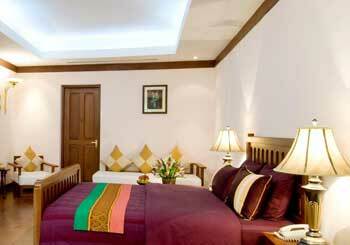 Royal Angkor Resort hosts Superior Twin rooms with handmade furniture and Deluxe amenities. All Superior has Bathtub. Our room categories have Fire Smoking Detector. 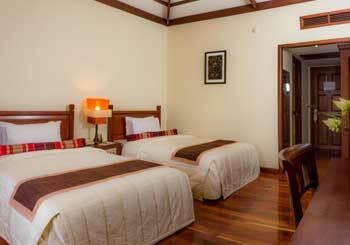 Royal Angkor Resort hosts Family Connecting rooms that are beautifully appointed with handmade furniture. All rooms are with a Jacuzzi Bathtub, Shower. - Interconnecting Corridors wih private Verandas. AZ Royal Restaurant Is an additional all day dining restaurant but built for size. Not only has it offered space but also spectacular view of resort. Perfect for big groups, our AZ Royal Restaurant is open for private reservations to cater large luncheons and dinners. derives from the name sunset; our pool bar is a perfect place combining a relaxing swimming pool where you can immerse in and of cold-refreshing drink to quench your thirst. Is the home of Apsara dancing performances. Open for both public and private viewing, our Royal Theater can hold a maximum capacity of 60 sit-down dinners. We have a special promotion each month. Upon arrival, you as our special guests will receive an invite with special discounts to try each of our special outlets.